The latest release in The Adelphi Collection from the BFI is a double-dose of effervescent vintage comedy- drama bringing two more rare Diana Dors films to DVD for the first time. 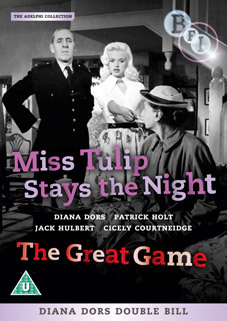 The Great Game and Miss Tulip Stays the Night both star Britain's blondest bombshell at her saucy best. Goals and glamour go together in The Great Game (Maurice Elvey, 1953), a high-scoring drama of football league corruption, shot on location at Griffin Park, historic home of Brentford F.C. and even featuring guest appearances from some of the team's players. With fine performances from James Hayter as Burnville United's unscrupulous team chairman, Thora Hird as his long-suffering assistant, and Diana Dors enjoying herself as man-eating secretary Lulu – not to mention a splendid eyeball-rolling turn from Dad's Army's John Laurie – the final result is a nostalgic Saturday afternoon treat for movie buffs and football fans alike. Laughter and thrills mingle in Miss Tulip Stays the Night (1955) directed by Leslie Arliss. Gorgeous Kate Dax (Diana Dors) and her crime-writer husband, Andrew (Patrick Holt), investigate the murder of eccentric spinster Miss Tulip (Cicely Courtneidge) at a remote country cottage. With the help – or hindrance – of bumbling P.C. Feathers, deftly played by British comedy legend Jack Hulbert, will they ever crack their crazy case and finally figure out whodunit? The distinguished supporting cast includes Joss Ambler, Pat Terry-Thomas and comedy veteran A.E. Matthews. Newly mastered to High Definition from the original film elements preserved at the BFI National Archive, the films are presented with an illustrated booklet containing film notes, original promotional materials and new essays, including a look at Diana Dors' clothes and style.